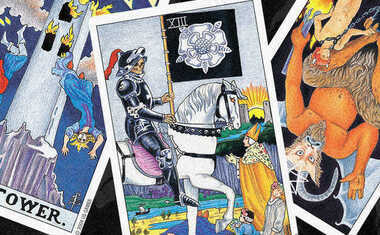 Find out what this month's 3-card Tarot reading means for you! We start with the Three of Wands Reversed as our Blessing. Now, when we look at this card upright we can see this man and he's standing on a hill and he's looking out across the ocean where he's seeing some ships passing by and there's another land far, far away. And, to me this is a card about: one, kind of like expanding new horizons, but two, thinking about what comes next. What's next in your journey? Where will your travels take you next? Where is it that I'm heading? Are my goals truly aligned to what I know of my soul's purpose? And we've got the Five of Wands. Now if you have a look at this card you'll notice that there are five people clashing and fighting. Now, this is clearly a card of conflict, tension, disagreement, and so on. So, I'm so sorry but I think for the month of July, it's likely that you're going to find yourself in a position where you disagree with the opinions of other people, and things can get a little bit heated. So you might find yourself in a couple of arguments, surrounded by conflict, rubbing people the wrong way... Some of this is a bit out of your control; you know sometimes there are folks out there who will just get upset no matter what you say. But if you find that there's a way for you to find more of a compromise, I suppose, then I really do encourage you to take it. Because I think tempers can easily get pushed over the edge this month, and people will seem to be getting a little bit protective of their thoughts and opinions, so the more that you can take a more peaceful approach, the better. So just watch out for those potential conflicts and tension, and see how you can make the most of it by bringing about peace and calm. And just remember: diversity in opinion is OK, but it's about creating a constructive environment for that to happen in. So, make sure you're the bigger person and you're creating that very constructive environment. What are some of the layers I can let go of this month? What is no longer serving me? What new things can I allow to come forth? And I think this is a really lovely card to look at against the Three of Wands Reversed. The reason for this is remember with the Three of Wands Reversed, we may be reassessing our goals, and reassessing our path, and I want you to know that with the Death card, that that's OK. In fact, that's actually a really good thing if you're saying, "I've been following this path for a while, but I know that it's no longer really fitting into where I really want to head in my life, and so I'm going to shed that skin." And that's OK. That's a good thing. That's what's going to create an amazing, fabulous month for you -- if you can let go of what's not serving you. 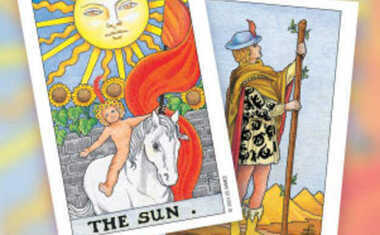 And certainly with the Death card, it's also a sign that change is coming through whether you like it or not. And we can choose how to respond to change. We can choose to resist it and go, "Oh I don't know, I like everything that's set," or we can say, "Yeah, change is as good as a holiday. I can deal with change." So I really encourage you to embrace the positive aspects of change this month and look for opportunities to create transformation, particularly as it relates to your goals and your personal spiritual goals this month. So, with that, I wish you the very best for this month ahead. I hope you have an absolute gorgeous month, and I look forward to connecting with you again very soon.